My favorite yoga workout over time has been Yoga Zone’s “Power Yoga for Strength and Endurance.” It’s easy enough that I can get into most of it no matter what shape I’m in, but challenging enough that I always get something out of it: I’ve done this off and on for ten years, and it’s never been too easy. It runs nearly an hour, but if I don’t have that much time (or energy), the first half stands by itself pretty naturally. I also like the variety in this routine–I’ve done a lot of different yoga tapes, and this one makes about the best use of the time, with the most interesting formula of poses. Speaking of this yoga tape, my decade-old tape started wearing out recently. Lo and behold, this very program is now streaming on Hulu–available free any time! 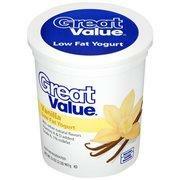 After yoga, I try to pack in some healthy protein, in the form of yogurt. Lots of people like to add sliced fruit to yogurt, and so do I (frozen blueberries make just about everything better–snacks, meals, motor oil), but I find that yogurt’s an easy cover for another healthy item–granola. I get big tubs of generic yogurt from Wal Mart, and these bags of granola. This brand isn’t too dry to start with, but mixing it into the yogurt really makes it go down sweetly. 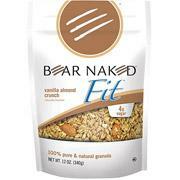 Banana or strawberry yogurt with some of this Bear Naked vanilla almond granola, after a Yoga Zone video, strikes me as time pretty well spent. Since my patrol is my family, I figured our patrol name would be “The Huston Family.” Silly me. When I discussed this with everyone, we had just watched an old episode of a certain great 80’s show that we’d borrowed from the library, so everybody quickly decided that we would call ourselves “The H-Team.” Our yell is based on an old inside joke we share–when people ask for comments or feedback from us, we respond with the most random, inane thing we can imagine: “I like pie.” This is our yell. “I like pie!” Inspiring, no? Surely it will strike fear into the hearts of any opponents that we might meet in some game.